Invisalign is a modern approach for straightening teeth. It is the clear alternative to metal braces. Invisalign helps patients correct a broad range of orthodontic problems, and the treatment is proven to be safe and highly effective. 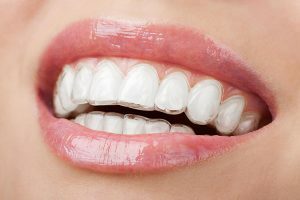 If you are not comfortable wearing metal braces or want a discreet solution for your imperfect smile, then Invisalign could be the answer to your worries. Because it’s comfortable and removable, many teens and adults choose Invisalign as an alternative orthodontic treatment. Your dentist at Cardiff Dental will work with you to create a custom-designed program that will address your specific orthodontic issue. This treatment program will consist of a full set of clear aligners that are customised and made just for you. Each aligner is different, helping to move your teeth gradually into their ideal position. You need to wear the aligners for around two weeks before switching to the next aligner in the series. Your check-ups will be every 4 to 6 weeks, during which your dentist will monitor the progress. During the check-up you will also receive your next set of aligners. Once the treatment is completed, your dentist will provide you with a suitable retainer to protect and maintain your beautiful, straight smile. If you have misaligned teeth, it’s best to ask for help from your trusted dentist at Cardiff Dental. We will thoroughly evaluate your case, and by doing this, we will be able to determine if you are an ideal candidate for Invisalign. Invisalign is one of the most modern methods available to straighten your teeth without pain, irritation, and disruption. The custom made aligners keeps your smile pleasant and natural looking throughout the treatment process. Contact us on (02) 4954 6888 today!